I’ve been a bad, bad Daring Cook. I’m finding that it is difficult for me to obtain certain perishable ingredients in Salem, and then coordinate that with an appropriate timeframe in which to cook them, so I’m starting to think I may have to sit out on future challenges. I was able to complete the August challenge with some modifications, but I haven’t had a chance to write up a post until now. 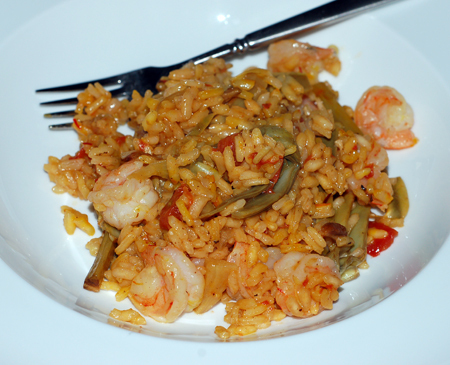 The August Daring Cooks challenge was Rice with Mushrooms, Cuttlefish and Artichokes by the celebrated Spanish chef José Andrés, a sort of variation on paella. I would have liked to try my hand at working with cuttlefish or squid for the first time, despite my many reservations about the potential for rubbery texture, but I was not able to find any here in town, so I ended up substituting with shrimp. I also substituted reconstituted porcini mushrooms for fresh buttons, but I at least got my hands on some fresh artichokes, so I had the challenge of getting those broken down. I ended up skipping the allioli for this recipe due to time constraints and lack of a mortar and pestle, although I did attempt a very similar aioli earlier in the month. Notice the emphasis on attempt: I’ve never been able to get my homemade mayonnaises and aiolis to thicken up sufficiently, even when they seem to emulsify properly. I’ve tried it by hand, in my Cuisinart and my mini-food chopper, all with similar results; the blender will have to be my next experiment, unless anyone has tips for me. Once I got the sofregit made and the artichokes broken down, this recipe actually was not that time-consuming. I sauteed my shrimp first and set them aside to try and avoid overcooking, and of course soaked the mushrooms in advance. For my liquids, I used a combination of water, leftover chicken stock, and mushroom steeping liquid. The end result was a very flavorful one-pot meal that everyone enjoyed, even the baby. I’m just sorry that I wasn’t able to post about it in a more timely fashion. 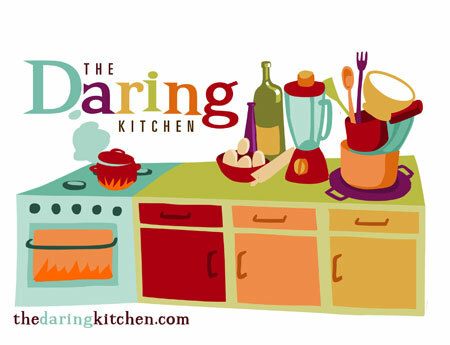 I am a member of the Daring Cooks. For more information and a list of my previous challenges, click here.